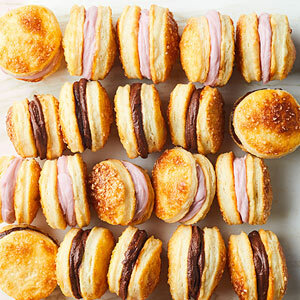 At Sister Pie in Detroit, they make these buttery, buttercream- or ganache-filled sandwich cookies from scraps of dough leftover from making pies. You can do the same, storing them in the freezer until you have enough. Or just make a fresh batch of pastry--it's worth it! The recipe comes from cafe owner Lisa Ludwinski's debut cookbook, Sister Pie. For cookies: Lightly grease two baking sheets; set aside. Unwrap one disc of pastry and place it on a lightly floured surface. Bang the dough with your rolling pin about 4 times, from left to right. Flip and bang left to right again. Begin rolling the pastry from the center forward, using less pressure on the edge. Every few rolls, rotate the disc a quarter-turn. If pastry starts to stick, lift it gently and sprinkle more flour underneath. If the top gets sticky, flip the disc over. Continue rolling and rotating until the circle is 12 to 13 inches across. Using a 2-inch round cutter, cut the dough into rounds and lay them on the baking sheets. Repeat with second disc of pastry. Refrigerate baking sheets, covered, until cookies are cold and firm, about 15 minutes. Meanwhile, preheat oven to 450 degrees . In a small bowl, beat together the egg and water. In a second small bowl, combine the granulated and turbinado sugars. Brush dough rounds with egg mixture and sprinkle lightly with sugar mixture. Bake until cookies are puffed and deep golden brown, about 8 minutes. Transfer sheets to wire racks to cool while preparing filling. To assemble: Sandwich 1 to 2 teaspoons filling between 2 cookies, gently pressing the sides together. Pie Cookies taste best the day they're assembled. Refrigerate leftovers in an airtight container. Chocolate Ganache In a heatproof bowl set over a saucepan of simmering water, combine 6 ounces chopped bittersweet or milk chocolate and 3/4 cup heavy whipping cream. Stir with a silicone spatula until completely melted and smooth. Chill, if needed, to reach spreading consistency.